We, at Green Meadows Hospice, believe in a natural progression of life to be held sacred to all. We believe in the uniqueness of each individual, their culture and beliefs, and honoring that at the time of death. 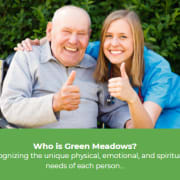 Here at Green Meadows Hospice, we pride ourselves in providing the highest quality of care to all of our patients. Whether you are a volunteer, nurse, or home care aide; together, we can make the last months of our patient's life as comfortable and fulfilling as possible. We do not just stop with our patients, we love to make our patient's families lives as easy as possible knowing that their loved one(s) is being cared for no matter the day or time to ensure all their focus is on spending time with their loved one(s). If you think you could add value to our team as well as our patient's lives, we would love to have you. Would you recommend Green Meadows Hospice?